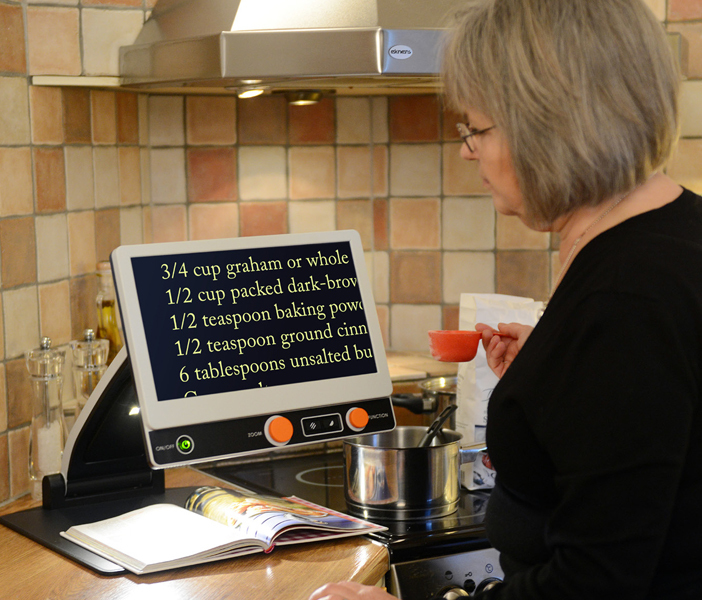 MagniLink Zip Desktop Video Magnifier - HD 13 control panel was designed according to the latest hi-tech standards while keeping client feedback in mind. It’s easy to find, learn, and maneuver - for example, the function knobs rotate and are simple to handle, easily seen, and there is an advance mode for advanced users. The 13 inch monitor has brightly colored screen edges, an anti-glare surface, provides crystal-clear sharpness, high contrast images, and a dimmer for light-sensitive users. The unit is easy to fold and unfold and can be carried to different locations. Its weight is less than 15 pounds and a protective, soft-shelled, zippered carrying case is included. When folded, it measures 13 x 18.5 x 4.7 inches.